The silent, space saving PANEL21 is specifically designed as front-end interface for rugged, secure sensitive environments where reliability and quality are major issues. The PANEL21 complements the rugged embedded "All-in-One" Panel-PC Family from MPL. 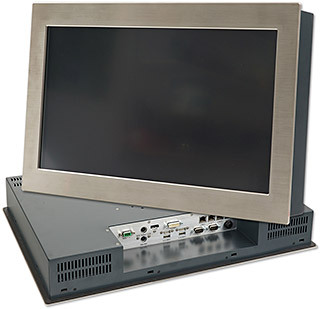 The Panel PC solution is compact and easy-to-integrate in new or existing environments. The "All-in-One" Panel PC product range is specifically designed and built for none standard environments to sustain most severe ambients. This combines a 21.5" display with excellent optical specifications, an optional touch screen and a complete range of embedded MPL designed low power CPU based single board computer from single-core Atom up to i7 quad-core. The front of the Panel21 is IP65 protected and comes with a stainless steel front. On the back side, interfaces of your choice will be available. Like all other MPL products, the PANEL21 requires no fan, is rugged, extremely flexible, therefore expandable for basically all customer needs and applications. The robust and front IP65 protected PANEL21 is the perfect solution as man machine/front-end interface for harsh applications like in transportation, maritime or mining and cement industry. Further as a space saving, fanless and noiseless system, the PANEL21 is the ideal solution for cabinet applications in telecommunication, kiosk information systems and Internet access points. The below given values are from our used standard high quality 21.5" LCD.